The author pays tribute to his friend and colleague, Tony Randall, describing their work on the television program "The Odd Couple" and working for the National Actors Theatre. Klugman's brief memoir of his friendship with Tony Randall stays true to the promise the author made to himself if he ever wrote such a book: &quot;I would never do two things: kiss and tell, and bore people with long histories of things.&quot; Boring this work isn't, as one would expect from a kid who grew up as the only Jew in a tough 1920s Italian South Philadelphia neighborhood, entered a college acting program to get away from his bookie and was cast by Garry Marshall in TV's <i>The Odd Couple</i> because Marshall had been impressed by seeing Klugman on Broadway in <i>Gypsy</i> getting spit on by Ethel Merman and not flinching. Although lacking in panache, the book does stay true to its stated intention of paying tribute to Randall, who founded the National Actors Theatre. The most endearing anecdote is that of how Randall cast Klugman in a 1991 benefit <i>Odd Couple</i> production, three years after Klugman had undergone throat cancer surgery and lost almost all his voice. 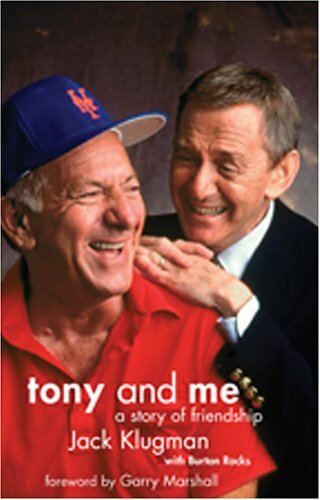 The chapter titled &quot;How Tony Gave My Life Back&quot; recounts how Klugman retrained his throat and regained his career. Though amateurish, Klugman's writing possesses rare conviction and humility. Photos. <i>(Oct.)</i> <br />Copyright &copy; Reed Business Information, a division of Reed Elsevier Inc. All rights reserved.